Yesterday I had the privilege of welcoming participants from across the country to our annual conference for law enforcement professionals and other community leaders on the topic of investigating and handling missing person cases. Each day in this country there are 100,000 of these active cases. For 18 years now, FVTC has played a lead educational role nationally to support the efforts of law enforcement in addressing child protection, abducted and exploited children, and missing adults. Beth Holloway shared accounts of her missing daughter, Natalee, as part of our college's annual national conference on missing persons. Beth Holloway, mother of Natalee Holloway, spoke at yesterday’s conference as well as at a session on campus for the community last night. Natalee was on a senior class trip to Aruba but didn’t return home with her classmates. She went missing and it was eventually determined that she had been murdered. Beth shared the incredible story of getting that call from Aruba, the months of effort to work with authorities in a foreign country to find Natalee, and her eventual resolve to turn this tragedy into making a difference for others. I can’t imagine how families deal with the abduction of loved ones and was in awe of Beth’s strength, courage, and resolve to live her own life in a way that was a positive force for others. 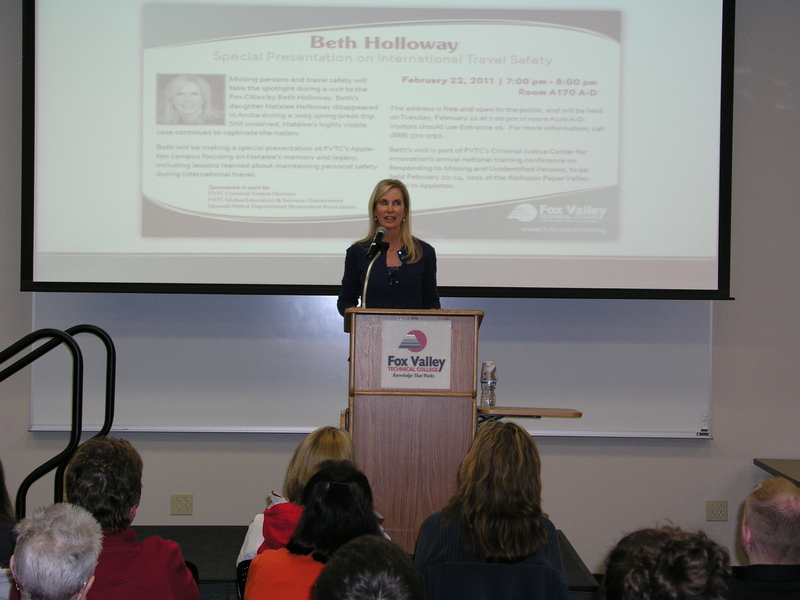 We had a great audience turn out from the community to hear Beth’s story firsthand. Had a chance to meet and hear Bart Starr speak here at the College last week. The Student Government Association had booked him as a speaker in their leadership series some time ago, but how great that he made an appearance here just days after the Packers won the Super Bowl! 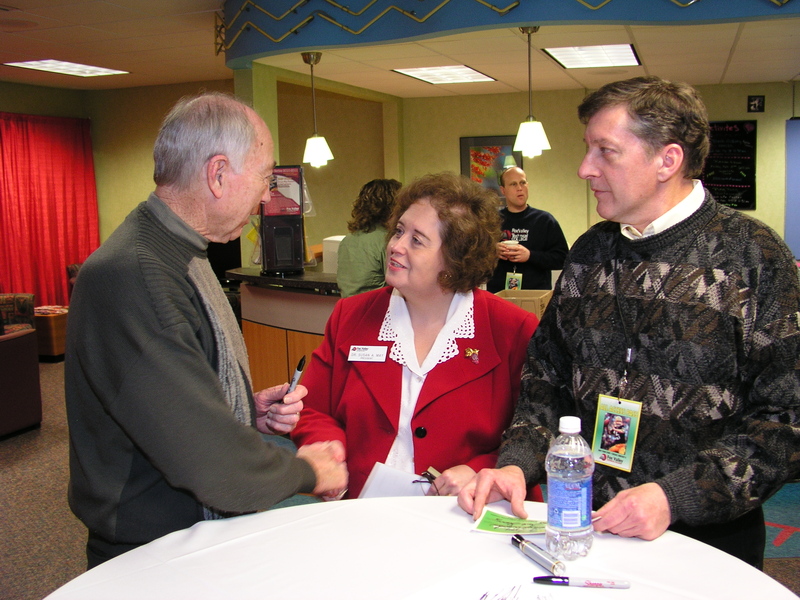 My husband, Tim, and I enjoyed the pleasure of meeting Bart Starr in our Student Life Center before his presentation. What a warm and down-to-earth person he is, even though he still seems to have rock star status with so many people. We had a great audience for this event…about 600 students, staff, and community members turned out on a very cold night to hear what Bart had to say. Bart’s presentation mostly focused on leadership and characteristics for success. He particularly challenged us all to focus on our attitude (as it determines our altitude) and on love–the love of other people, passion for the work we do, and love of life in general. He did a fine job talking about leadership theory, but I found it fascinating that it was when he shared his football stories that he really lit up and showed his own passion. Hearing directly from Bart Starr about his sideline conversation with Vince Lombardi regarding one of the greatest plays in the Ice Bowl (his quarterback sneak) was truly something special. Won’t forget that anytime soon. 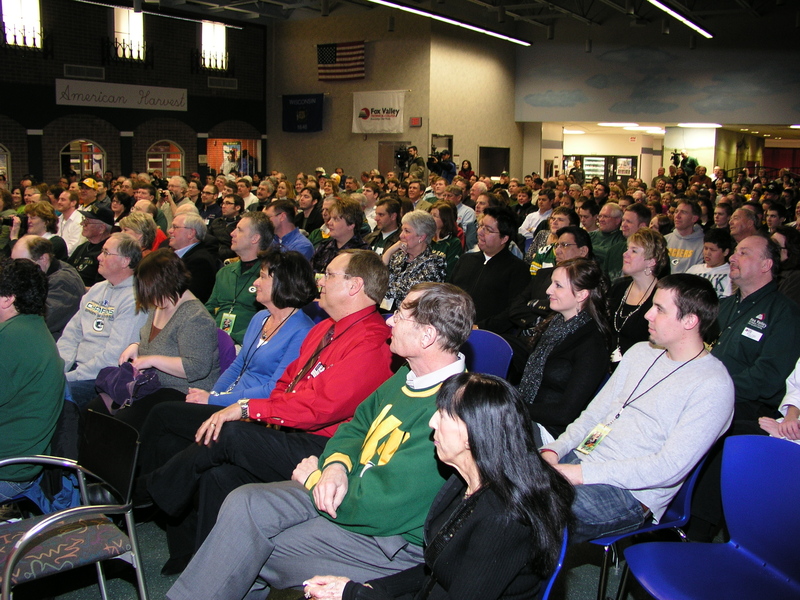 Fox Valley Technical College was honored to welcome the legendary Bart Starr to its Appleton Campus. Bart also has shown his passion for making a difference in people’s lives throughout his years since football. He has been a major sponsor, and often spokesperson, for Rawhide Boys Ranch. It was really great when a young man from the audience stood up and thanked Mr. Starr for all he’s done for Rawhide over the years; he indicated that he was a 1997 graduate of Rawhide and now a Criminal Justice student at Fox Valley Technical College! I’ve been thinking about the pressure that our Packers must be feeling this week. Now, I know this is just a game and that these guys are paid quite well for the skills they bring to the field. But I still can’t help but think about the pressure they are under, and have been under the last few months, to not let us down. But whether you realize it or not, we are playing a “super bowl” here at the College every day. We have many, many people counting on us to come through each day–all of our students, employers of the region, communities, legislators, taxpayers, and others. It takes a team of many individuals to serve our constituents and people are counting on us more than ever not to let them down.